Tom Satterly is a highly decorated combat veteran, who along with his teammates, was portrayed in the Oscar Winning 2001 film: Black Hawk Down. 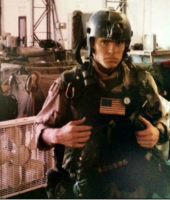 Tom served in the Army 25 years, 20 in the US Military’s most elite Tier One unit, Delta Force, and has been involved in and led some of our nations most important campaigns. As a member of Delta Force, Tom has been deployed countless times, and led hundreds of missions. Beyond Tom’s proven experience of leadership and critical decision making in high-risk environments, Tom also has fought and is winning his own “silent war” off the battlefield, at one time coming close to taking his own life and becoming a statistic. His innate strengths of courage, perseverance, and “can do” attitude has saved his life countless times. Knowing we all have our personal battles we fight, Tom chooses to share his story with others in order to help them overcome their personal obstacles. He takes an honest approach to sharing his unique life lessons both in his military career and personal life in order to connect with his audience on how they too can succeed despite any challenges they may encounter. Find out more about Tom Satterly here.